Molalla FFA teams competed at the event in Horse Evaluation, Meats Evaluation, Agricultural Communications and Food and Science Technology. 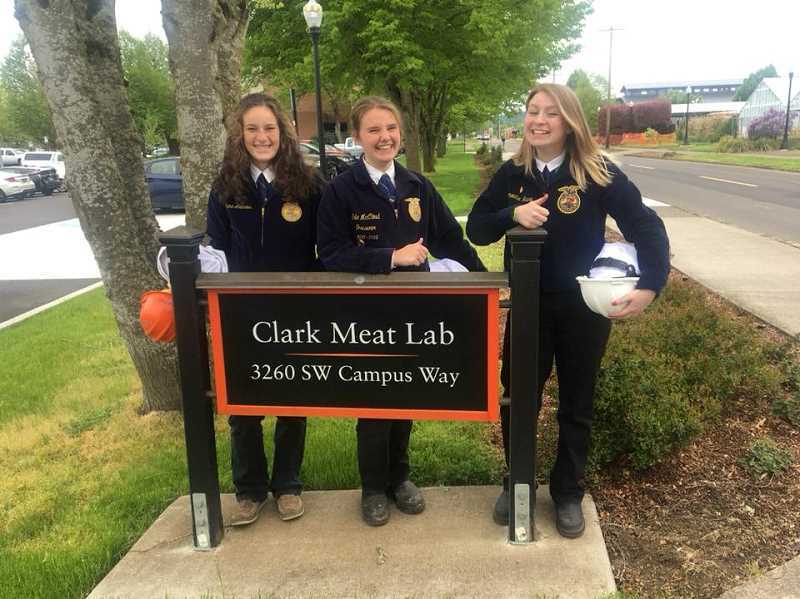 On Monday, May 7, four Molalla FFA teams participated in contests at the State FFA Career Development Event held at Oregon State University. None of the teams will move onto the National competition, but Behrle was proud of the members' work. 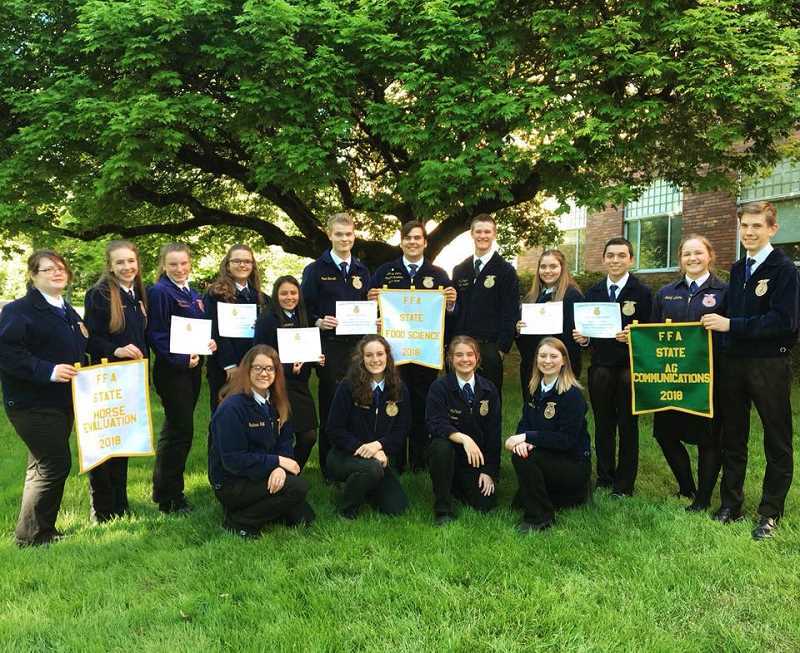 "In FFA only the first place teams move onto Nationals unfortunately," Behrle said, "but the students still all did an amazing job." This team is made up of Kelsey Morgan (3rd high individual in the contest), Shelby Nunn (9th high individual in the contest), Chloe Corless, Sky Fackrell and Kylene Eaglebear. The Horse Evaluation team is coached by Danell Blair, Molalla High School agriculture teacher. The contest includes a general knowledge test, evaluation of six horse classes, and oral presentations. The oral presentations include two sets of reasons for their evaluation of the horse classes. Participants must prepare and memorize their presentations within 20 minutes or less, and are penalized if they use notes. This team includes Halie McCloud, Samantha Moore and Emma Andrews and is coached by Mackenzie Behrle, MHS agriculture and leadership teacher. In the meats competition, teams must identify 30 retail and wholesale cuts of beef, pork and lamb; determine a carcass maturity and marbling score; use mathematical calculations to determine the yield grade for small end rib steaks or beef carcasses; and evaluate six classes of beef, pork and lamb. The contest also includes a team event of answering questions on the retail and wholesale cuts of meat they evaluated. This team, also coached by Behrle, includes Natalee Litchfield (5th high individual in the contest), David Fregoso (8th high individual in the contest), Dominica Burkhoff and Clay Sperl. The Agricultural Communications contest is essentially a journalism contest, according to Behrle. The team is required to develop a media plan for an assigned scenario and then, based on that plan, give a 10-15 minute oral presentation plus answer questions for an additional five minutes. Participants also take an editing quiz and a communication quiz. Finally, they assume a certain role for a press conference, after which one person makes a website, another makes a video, another writes a newspaper article and still another writes an op-ed based on the press conference topic. The Food Science and Technology team consists of Emilie Mendoza (4th high individual in the contest), Gavin Barrett (6th high individual in the contest), John Cross and Matt Stephens. Behrle is the coach. The contest includes a knowledge test, response letter, identification of food safety violations in pictures, identification of 10 different aromas from a list of 40 options, and taste testing and analyzing differences in food samples. For the team portion, in just 30 minutes students must develop a new food product, including developing a proper nutrition label, marketing plan, packaging and the process by which the food is made. Afterward, the team gives a 15-minute oral presentation and answers questions for five minutes.